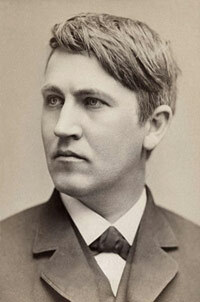 The Edison Awards are inspired by Thomas A. Edison, an American icon with an international presence. Edison remains the standard for measuring technological prowess and entrepreneurship among today's geniuses of creation and management. His inventions were marketed all over the world and Edison remains one of the best-known historical figures. A savvy businessman and shrewd manager, Edison had enormous talent for transferring technology from laboratory to market. By designing economic considerations into nearly all his inventions and recognizing the critical role that promotion and hustle play in a product's success, he provides a powerful model for corporate leaders even today. Edison is a transcendent figure, an inventor, manufacturer and businessman whose successes - and failures - continue to provide insight as meaningful today as it was a hundred years ago. While Edison's genius spawned many formative inventions of the modern world, his greatest invention may well have been the first industrial research laboratory, a prototype for today's corporate research and development centers. As one of the most brilliant inventors and entrepreneurs of modern times, he shaped not only industrial America, but also mass entertainment and contemporary culture. Thomas Edison executed the first of his 1,093 successful U.S. patent applications on 13 October 1868, at the age of 21. He filed an estimated 500–600 unsuccessful or abandoned applications as well. Edison also received many patents in countries other than the United States. No complete list exists, but Dyer and Martin's 1910 biography, Edison: His Life and Inventions, contains a compilation of 1,239 non-U.S. patents awarded in 34 countries.